Daedalus, a Spanish company specialized in software for information analysis, has launched Textalytics. Defined as Meaning as a Service, it consists of a set of semantic APIs in the cloud, which allow to incorporate capabilities for extracting meaning from multilingual content in various industries and applications, in a simple and efficient way. The development of semantic technologies allows to automatically extract information from the vast amount of unstructured content in which companies are immersed: social media conversations, emails, news, financial statements or records, enabling -among others- applications of brand monitoring, Voice of Customer, social CRM or e-discovery. Lately, providers specialized in semantic technologies have been offering this functionality in the form of APIs in the cloud, for incorporation into vertical products and custom developments. However, the current supply of semantic APIs is generally horizontal and low-level, offering basic functionality as lemmatization, part-of-speech tagging and entity extraction. But usage scenarios are very diverse and impose very different requirements of precision, recall, and type of language. Anyone who wishes to develop a non-trivial application of these technologies is bound to a costly learning and trial and error process. 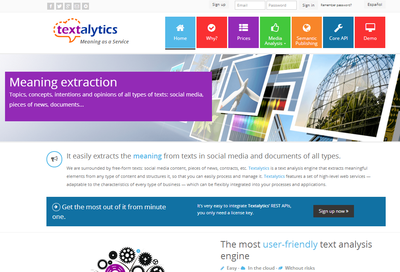 Textalytics is a semantic technology offering in service mode that provides developers and integrators with high-level, multilanguage semantic capabilities. Unlike other products with a more horizontal character, Textalytics offers several APIs, each of them with a specific functionality which is close to an application domain, along with SDKs and plug-ins that reduce the resources required to obtain results and the time-to-market for developments. Contrary to semantic APIs with a "do-it-yourself" approach, Textalytics provides an offering in plug & play mode. Over the coming months, Textalytics will incorporate specific APIs for various scenarios and applications. Currently a first version of the API for Media Analysis (social and traditional) and a Core API featuring granular, horizontal functionality are available. In successive releases, the Media Analysis API will incorporate features to perform buying signals detection and reputation analysis. In September 2013 the Semantic Publishing API will be released, which will initially include functionality for tagging and enrichment of content and text proofreading. As for the covered languages, Textalytics is available in Spanish and English, with French, Italian, Portuguese and Catalan in the immediate roadmap. The high-level technology offered by Textalytics has been applied successfully for clients such as PRISA, Telefónica, Unidad Editorial and Vocento. Textalytics was presented at the recent LT-Innovate Summit 2013 (European industry forum of language technologies) in Brussels. Textalytics is a trademark of Daedalus.